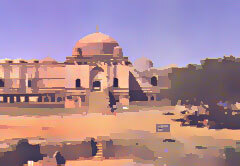 he extensive hilltop fort of Mandu is one of the most interesting sights in central India. Mandu is a celebration in stone, of life and joy, of the love of the poet-prince Baz Bahadur for its beautiful consort, Rani Roopmati. The balladeers of Malwa still sing of romance of those royal lovers, and high upon the crest of the hill, Roopmati's pavilion still looks down upon Baz Bahadur's palace, a magnificent expression of Indo-Islamic architecture. Perched along the Vindhyan ranges at an attitude of 2000feet, Mandu, with its natural defenses, was originally the fort capital of the paramara rulers of Malwa . Later, towards the end of the Sultans of Malwa, one of whom renamed it Shadiabad- The City of Joy. The best time to visit is July to March. 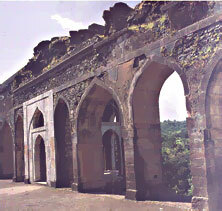 But while all other places are closed for tourism during Monsoons, Mandu offers the best time in this period. In fact, Mandu is more of a monsoon resort than anything else. The natural surroundings are in full bloom during monsoon months. 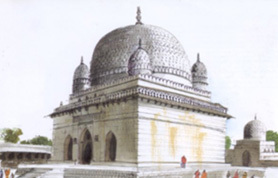 Built by Hoshang Shah's Khilji, this' place of gold coin' facing the jami masjid was conceived as an academic institution (madrassa) for young boys and study cells still remains in a fair state of preservation. In a same complex he built seven storeyed tower to celebrate his victory over Rana Kumba of Mewar, of which one building survived. Also ruins is the tomb which was intended to be the largest structure in Mandu, but which collapsed due to hasty and faulty construction.